For more October photos visit our forums. Please feel free to post your own photos of the plants in our garden in this thread. October is a popular time in the garden. Almost everyone notices the seasonal changes in plants because of the transition from the cool, restful shades of green to the warmer hues presented by leaves and berries. Whether we look forward to the duller, soggier days ahead, we can still appreciate nature’s subtle signaling. This year we can’t promise great autumn colour on absolutely everything (although there will still be plenty), as summer heat and low humidity has a baking effect on many deciduous plants. However, fruits of many sorts are prolific this year and October will be a boon for people (and birds, as well). I presented a few examples of mountain ash and whitebeams in September’s blog, and these, as well as scores of other Sorbus species will be especially bounteous this year, but I thought we could consider a few other fruiting ornamentals this month. “Fruit” is a botanical term that describes the structure that encloses seeds produced by a flowering plant. Fruits are not always obvious, nor always edible, although this is the way most people think of fruits. Similarly “berry” has a specific meaning that doesn’t necessarily agree with the common vernacular (tomatoes and bananas are technically berries, while mountain ash fruits are not—they are, like the fruits of apples and pears, known as pomes). I like to bring this up, because fruits of all kinds—even the dry, woody ones—are fascinating and worth a look. Consider the kirengeshomas: hydrangea relatives noted for their bold, jagged-edged leaves and yellow waxy flowers. Once the flowers are pollinated and the petals have fallen away, the seed-containing ovaries, which are held high above the withering leaves on wire-like stems, expand to become a glossy, marble-sized fruit with antennae-like appendages. Very weird. 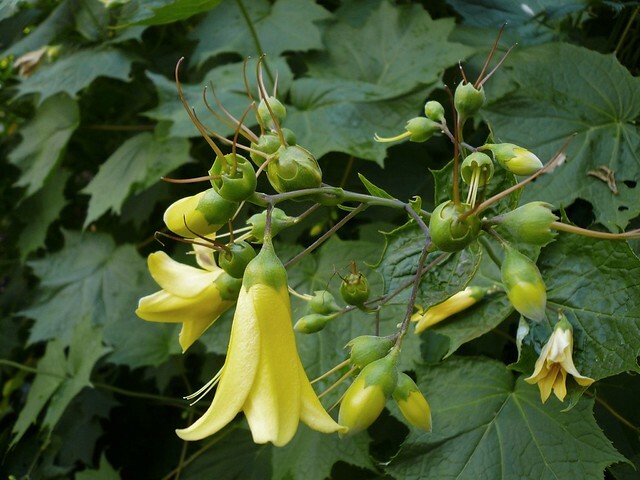 Look for Kirengeshoma palmata along upper Asian Way near Straley Trail and all along Stearn Trail down the hill toward Lower Asian Way. The hydrangea family has other surprising fruits in store. The typical hydrangea has a tiny urn-shaped dry, capsular fruit. Individually insignificant, the typical hydrangea capsule is borne in a mass of hundreds of capsules on a spreading inflorescence surrounded by a circle of showy, but sterile flowers. Lovely en masse, but not very exciting, unless you have a microscope. On the other hand, Hydrangea febrifuga, the hardy dichroa, produces masses of indigo blue berries in the fall. Andy Hill, Curator of the David C. Lam Asian Garden, collected seed from a population of in Sichuan Province in China in 2009. A sizeable grouping of these seedlings on Siebold Trail at Rock Trail now regularly produce these extraordinary fruits. Kiwifruits are not only true berries, but edible as well. The familiar kiwifruit is Actinidia deliciosa, an impressively vigorous climbing species native to China. The fruits are normally produced on our plants (Upper Asian Way at Stearn Trail, in Wharton Glade and in the Food Garden), but only when both male and female flowers (borne on separate plants) are available to pollinators. This year, the fruit-set has to be seen to be believed. The hardy kiwi (A. arguta) produces masses of grape-sized, hairless fruits (it’s also known as the grape kiwi). There is an enormous plant growing up a pair of large western red cedars just to the north of the Upper Asian Way-Stearn Trail intersection and trained specimens in the Food Garden, as well. The fruits of both species are brownish and well camouflaged among the leafy branches, but become more visible toward the end of October as the leaves begin to drop away.